Kay folks here's a little step by step I've put together. It can be a little tedious but once you get the steps down you can really zip through it, and you'll be pleased with the results. Fig 1. 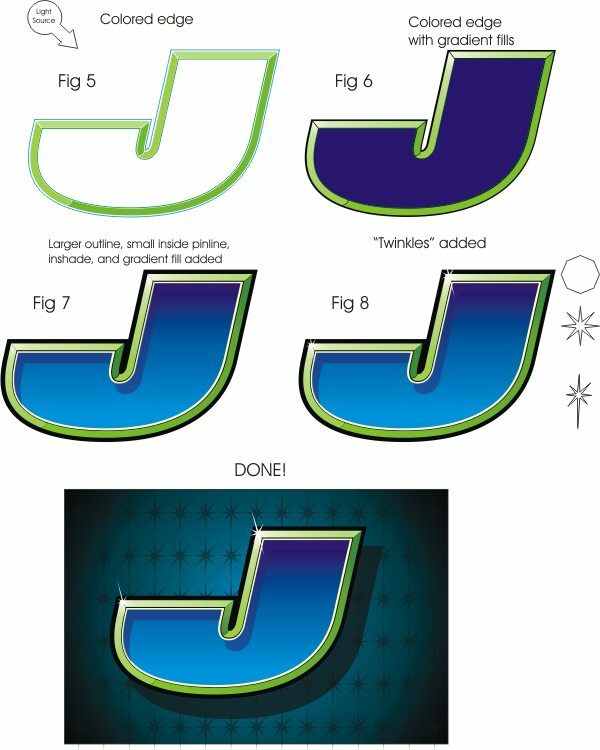 Here I've chosen the letter "J" cuz it has both straight and curved elements to it. I have put three outlines on it. 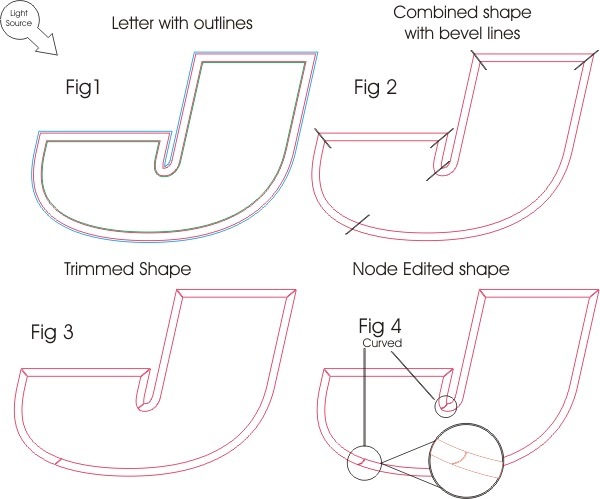 The first outline is quite small off the letter, the second one is gonna be combined with the first to create your bevel. The distance of the second can vary depending on how thick you want your bevel. The third I added for an outline to be filled later. And don't forget when you put the outline (contour in Corel) to break it apart or separate it from your original object. Fig 2. Now select your first and second outline (red) and "combine" the two. I like to duplicate a copy next to it and work on it there. Next draw small boxes and angle it on your corners. They must be closed shapes to do the next operation. Once I have drawn one box I can duplicate the rest and modify the angle for the next corner or transition point. Now select all of your boxes and combine them. With your boxes selected go to your shaping menu and select "Trim" make sure the source object box is checked. Now simply click on yer combined outlines. Fig 3. Now your Outlines will be trimmed and you will have separated objects. Your little boxes will remain so you will have to delete them. Fig 4. Here I had to go in with my shape tool and curve the transition points on the curved sections and do a little editing on the corners to fill the gap abit. I do like to leave a little gap to define the edge. Fig 5. Now you can place your beveled edge on your letter and start adding color. You will have to "break apart" the shape first so you can separate the shapes to add different colors to them. I chose my Fav color "Slime Green" for the beveled edge. The lightest shade of your color will be on the top and left side of your letter, the darkest on the right side. I used my base color Slime Green and mixed the lighter and darker shades myself. Now its getting to look cool. Fig 6. Just for some added effects I like to add gradient fills on the bevels. Yer lightest spot should be your northwest corners. I added a bit more darkness to the very upper right corner to add a bit more contrast. Don't go too light with the fills or you will lose or gain too much contrast so you may have to play around with the fill for a bit to get it right. Since my bevel color is on the light side, I colored my letter a dark purple. Fig 7. Here I've added an off white pin line to separate the dark letter and edge abit. A gradient fill on the letter and an in shade for some dimension. I also beefed up the outside outline. Fig 8. This where we can add some "Twinkles". Select your polygon tool, Hold CTRL and draw an 8 point polygon. Get your shape tool while holding CTRL grab one the nodes and drag it inward to your desired radius. Now you have to convert your object to curves, once you have done that you extend the "arms" on it. Fill it with white and place it on your brightest spots. Its a neat little effect. Your pretty much done! I added a dark background with a hot spot in it and a drop shadow with a transparency on it to give it that natural look. Remember to have fun with it and do some experimenting because "CTRL Z" is your friend. How to achieve the in shade. This is actually quite easy to do. First thing you do is duplicate your letter off to the side. I prefer to move it on axis so placement back on top of original letter is easy. Duplicate another letter in front of it and move it down and to the right. Select the front letter. Now go to your shaping menu and select the "trim" function with the source object box checked. Now just click on the letter in the back and there ya have it. 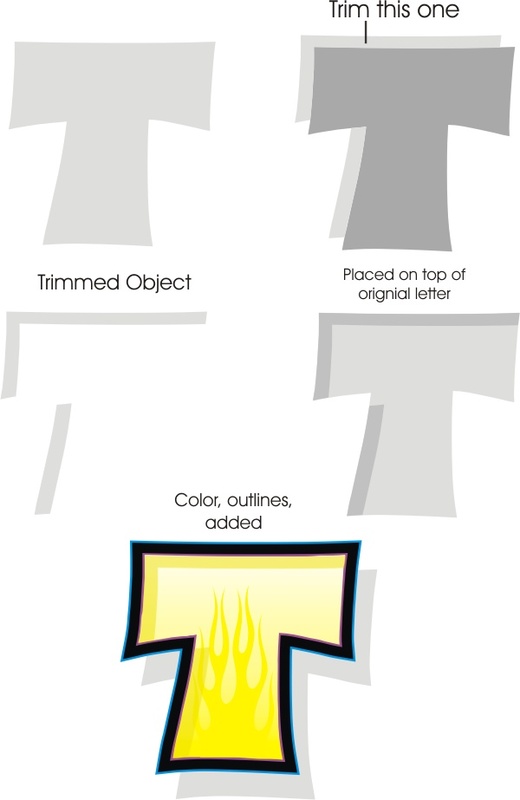 Place you trimmed object on top of the original and now you can add color and effects to it. Pretty easy and it looks cool!